Morgan sold 1,600+ V-twin-powered 3 Wheelers so far, and from now on, you can also buy one with a full electric drivetrain and a range of 150 miles. But there’s much more to to the new car than that, including the steering wheel of a 1940s Ford pickup truck. It’s not like Morgan just threw out the motorcycle engine to replace it with an electric motor. For starters, the power unit is at the rear now, and all those shiny brass bars at the front are conductive cooling fins working hard cooling the battery pack. The body was completely re-designed to be as streamlined as possible, and it’s also mostly made of carbon fiber, something Morgan has never done before. As a result, the EV3 is significantly lighter than the regular version, and with a passenger in place, it also has the perfect weight balance. A flat torque curve also means more 3 Wheeler burnouts. 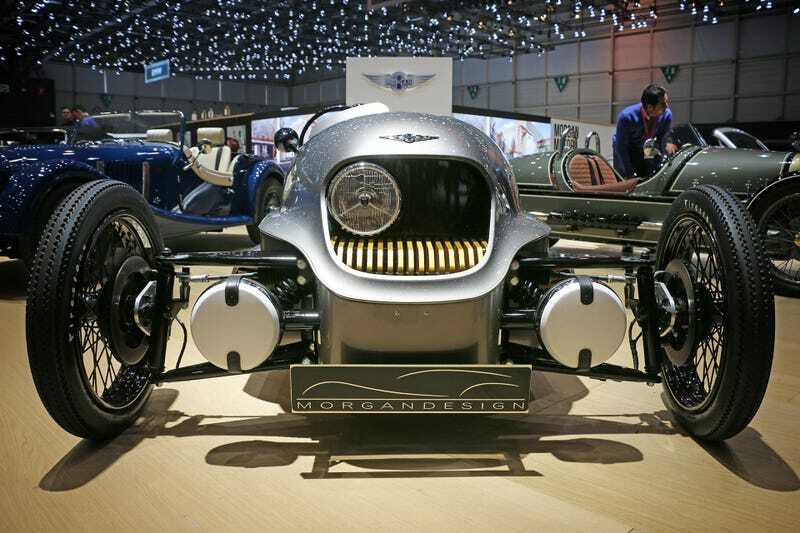 Jonathan Wells, Morgan’s Chief of Design, told me he was inspired by the aero cars of the 1930s and motorcycles sporting an asymmetric headlight layout in the following decades. The traditional Lucas lamp is optional, and the EV3 is going to be one of Morgan’s most customizable models once it enters production late this year. The EV3 has two driving modes. Eco uses regenerative braking and limits throttle response. In Sport, you get all 61 horsepower with enough torque to take you above 90 mph. Regen is also off in this mode, improving pedal feel. Inside the cockpit, you’ll find a simple dash with machined toggle switches and a drive selector spelling R N D. Morgan got £6 million from the British government to spend exactly on that. Some hot rodder company in America is also supplying Morgan with steering wheels from a 1940s Ford pickup truck, while the fuel filler got converted to a power inlet, through which you can charge up your EV3 between 45 minutes and 8 hours depending on the power source. This is Morgan’s first step into the next hundred years, and while it might look tiny, size isn’t everything.